Atlantis was my home in 2008 and 2009. On July 8, I was filled with mixed emotion: excitement at seeing Atlantis lift off and melancholy knowing that it was the last launch of the space shuttle era. During my flights, my crewmates and I used Atlantis to continue building the International Space Station (ISS) and making it the large and robust scientific outpost in space that it is today. The amazing work being done on ISS will help ignite the next generation of explorers – just like those students who attended our pre-launch “Unconference” in Orlando. One of our special guests was Irene Stofan, a former teacher and the mother of Jim Stofan, my deputy in the Office of Education. I asked Irene to be my guest blogger this month and to reflect on her experience attending the “Unconference” – I know you will enjoy reading her impressions. The space shuttle countdown clock neared 4 minutes and a single, lovely voice began the anthem. As one, swelling with pride, over 5000 voices joined in a robust rendition of “The Star Spangled Banner”. At its conclusion, when the crowd took to cheering again, my glasses were misty and many were wiping tears from their eyes. But there was greater drama ahead. When the clock stopped suddenly at 31 seconds, that same crowd held its collective breath in complete silence for several long minutes. The countdown finally resumed to wild cheers. A few moments later, in a spectacular liftoff, Atlantis blasted into history. Elation at a successful launch was mixed with profound sadness for the end of a storied chapter in our nation’s exploration of space. But this last week was as much about the bright promises of the future as it was about the stunning successes of the past. Thanks to my genetic contribution to NASA — my son, Jim Stofan, Deputy Associate Administrator for Education — I was privileged and honored to attend not only the launch but also the STS-135 Education Student “Unconference”. Two hundred high school, college and graduate school students participated, led by panels of scientists both from NASA and private industry. 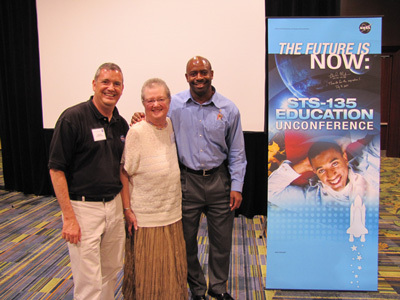 Leland Melvin, NASA’s associate administrator for education and a two-time shuttle astronaut himself, created a wonderful educational experience for Unconference participants. He and his staff hoped that students would set the agenda, driving the discussions in each workshop and picking the brains of their panels of experts. Turning the educational agenda over to students is risky business; lectures are so much safer for the teacher. But Leland, his staff and the experts from NASA and private industry took the risk and reaped the rewards. In every session I attended, NASA education staff organized responses and kept both the experts and the students on track. The scientists who participated were excellent teachers, providing clear explanations to students and yet continually eliciting more ideas and questions from them. The students were marvelous, generating spirited discussions with panelists and with each other. To my consternation, I often found myself not quite understanding the workshop discussions or even some of the students’ questions. I am an English teacher, and the participants and leaders were math and science folks. But I do understand enthusiasm, involvement, and inspiration. Every teacher longs to light these sparks in students, and NASA’s efforts produced those responses in abundance. One of the highlights of the conference was a tour of the Kennedy Space Center prior to launch day. Time and time again, I was moved by the dedication of NASA employees to their jobs. During our tour of an Orbiter Processing Facility, the project manager of Endeavor wept as she spoke of her 15-year commitment to the space shuttle. Whether they work on rockets, orbiters or satellites, robotics, aeronautics or technology, fly in space or educate the next generation, NASA employees are extraordinary in their commitment to and love for what they do. When I think of the amazing people I met at the Unconference, as well as during the tour and launch, I am confident that the future of NASA will outshine its fabled past. The enthusiasm and commitment of these communities of students, scientists and educators, and the collective brainpower of all those formidable intellects, are enough to cure all diseases, save our global environment and send a thousand missions to the stars and beyond.